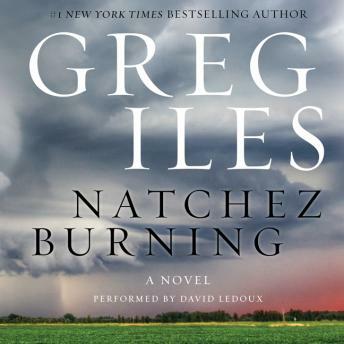 This is the first novel by Greg Iles that I've had the opportunity to listen to and I loved it! It's longer than a lot of audio books but it doesn't drag or get dull like you might expect. I purchased the 2nd book in the trilogy and am just as satisfied. Without a doubt I will get the 3rd and anything else by this author I can get my hands on! I enjoyed the premise of the book, and it caught and held my attention from the start. However, I thought it went on too long and was repetitive towards the end. The narrator was tough for me to listen to when he was doing the female characters, especially Katelyn Masters and Annie Cage. I thought his narration made them sound very whiny. I also thought some of the plot was too predictable -like in a horror film when the characters stupidly go off by themselves and you know something is going to happen to them. I'm not sure I will read anymore of the trilogy simply because if the others are this lengthy, they're too long. The book was riveting from start to finish and the narrator was superlative. I enjoyed the fact that there was a lot of history woven into this tale set in the South of the not too distant past. Masterful job of writing. The book is awesome. I mean you can hardly turn it off, the story is so good, so intense, and I can't wait to read the book that follows this one, The Bone Tree. The narration wasn't my most favorite. In the beginning it was hard for me to listen because the narrator has a very unique way of pronunciation. I almost didn't get this book because of the way it sounded in the sample. Trust me though, you get used to it and it's so worth it to listen!! I think Greg Iles is an exellent story teller. He has a good sense of humor along with great research for precission writting. Although I see that another peorson rated the narrator poorly, I found him to be very good. I can't wait for the 3rd book of the trilogy. Great book.! Kept my attention and had a good narrator. Hard to be a captive audience with this novel. Disappointed and reluctant to download and others written by same author. A narration that did not hold your attention. Another great book from my favorite novelist destroyed by the over dramatic narration. He made the listening unbearable. I actually couldn't finish because of the extremely overdone reading. What a shame after waiting three years for the latest Penn Cage thriller. Great book...suspense drama and shocking...narration excellent.